For decades, professional golfers, instructors, analysts, and fans around the world have tried in vain to decipher the secret of Ben Hogan s swing. The legendary golf master spent most of his early years trying to tame his notorious hook and, in the process, invented the purest, most effective swing in the history of the game. Though he openly discussed some aspects of his fabled secret, Hogan held back key revelations to be shared in strict confidence with less than a handful of devotees. Now, for the first time, the complete model of Hogan s secret swing technology is available to golfers everywhere. In this unique volume, Tom Bertrand shares the revelations about Hogan s swing that PGA Tour player John Schlee—one of the rare few to receive personal instruction from Hogan—held in confidence for so many years. Assisted by Printer Bowler, Bertrand chronicles the remarkable era in his life when he learned Hogan s techniques—first as a student and later as an instructor—at Schlee s Maximum Golf School during the 1980s. Having validated these teachings for himself and with countless students, Bertrand relates here how anyone who loves and plays golf can bring Hogan s magic into his or her own game. All of Hogan s secrets—including the "missing link" known only to Schlee and a handful of others—are revealed, reviewed, and explained here in Bertrand s Legendary Golf system, featuring slow swing movements you can use to correctly guide your swing through Hogan s famed "chain action" sequence. Drawing upon his exclusive access to Schlee s conversations and experiences with Hogan, Bertrand provides a simple, step by step practice plan for learning the key elements of Hogan s swing that you can adopt in a short time, no matter what your skill level. One of the book s special features is a collection of Hogan s "tricks of the trade"—fascinating new ways to visualize and play the game that reveal the range of Hogan s imagination and mastery. Bertrand s tales of his apprenticeship under John Schlee bring to light many intriguing bits of history about the game previously unknown to the public. A special bonus chapter features a first ever chronology highlighting the step by step evolution of Hogan s "secret" from the 1930s to the present. 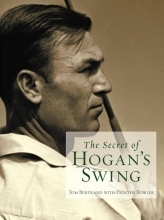 The Secret of Hogan s Swing is both a testament to Hogan s monumental gifts to golf and an accessible guide to the elements of his swing. This book complements and essentially completes Hogan s classic Five Lessons: The Modern Fundamentals of Golf. Finally there are no more secrets.